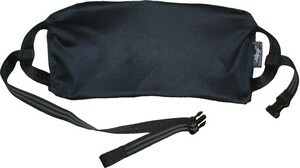 AirFit™ Cover with Attaching Straps. BackRest. Lumbar Support Cushion. Back Rest Pillow. Extra Care for Your Chair. Cover with Attaching Straps. Specially designed for those who sit at a desk. Includes AirFit™ Cover with Attaching Straps only. Ideal for office - computer - task chairs. Non-slip, non-stretch attaching straps with dual side closure buckle. Cover constructed of durable and breathable mesh synthetic fabric. Can be positioned with valve pointing up/down or right/left. Dual openings for right or left sided valve position. Attaches securely to most seats or chairs. Protects the AFBR™ from the damaging effects of the sun. AirFit™ Complete Seating Support System. Includes both the AirFit™ BackRest and Cover with Attaching Straps.